For this “junior movie brat,” there are no accidents. 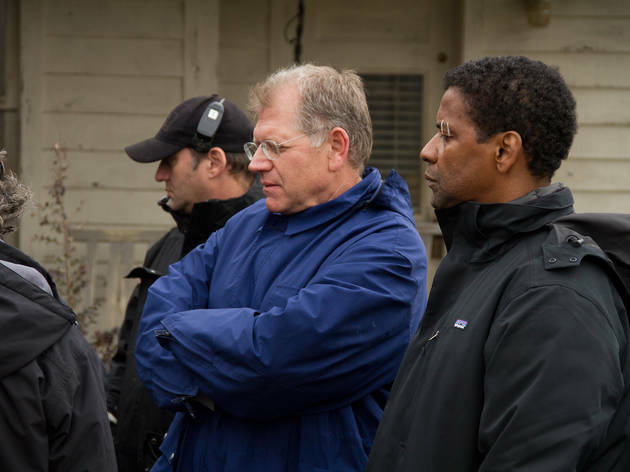 A brief history of Robert Zemeckis: Well-known for the technical virtuosity he displayed in such crowd-pleasing blockbusters as the Back to the Future series (1985–90) and Who Framed Roger Rabbit (1988), this Steven Spielberg protégé (a “junior movie brat,” per his words) made a turn toward more serious, though no less effects-heavy, fare with the awards-accumulating Forrest Gump (1994) and Cast Away (2000); even his big-budget sci-fi excursion Contact (1997) was more Space Odyssey than Star Wars. Eventually, Zemeckis moved into the uncharted realm of motion-capture moviemaking, where live actors outfitted in computer-connected bodysuits gave startlingly animated life to iconic figures from the worlds of Chris van Allsburg (The Polar Express), Old English myth (Beowulf) and Charles Dickens (A Christmas Carol). His latest film, Flight—a gripping drama about a pilot, Whip Whitaker (Denzel Washington), who battles several longtime addictions after miraculously landing a malfunctioning airliner—initially feels like a throwback to the pre-motion-capture days, when Zemeckis was just getting his feet wet with more straightforward, adult-oriented stories. But it’s clear as the movie progresses that this moody character piece is a much more mature and confident work, with an unapologetically tough-to-love lead and mesmerizingly deliberate rhythms that cut against much of the typical Hollywood dross in ways those earlier movies managed only sporadically. “The things that made the American movie unique and popular are the things that I think are kind of tiring nowadays,” Zemeckis, 61, says while lounging over a cup of tea in a Manhattan hotel. “There’s a sophistication to the modern audience and such a well-defined history of techniques in movies that things have to be redefined. In my opinion, one of the reasons movies are so bad is this idea that writers are interchangeable. I’ve never believed that. I think a good director has to understand writing." The writing was, unsurprisingly, what first attracted Zemeckis to this project, about a functioning junkie who is shell-shocked into a roundabout search for redemption: “Flight is all screenwriter John Gatins,” he says. “This is such a personal piece, and John became my creative soulmate throughout the making of the film. The essence of what is in the script, through all its drafts, came from the same brain. And Denzel has a very mysterious, instinctual rhythm that I knew would fit Whip perfectly." Flight certainly showcases the Oscar-winning Washington’s ability to play vulnerable with an edge—Whip’s spiraling bad behavior (snorting coke before the ill-fated flight; downing every bottle in a hotel minibar the night before a life-changing moment of reckoning) reacts powerfully with the actor’s innate charisma. “What I learned in making the motion-capture movies was that the actors can set the pace and the timing of a scene like they do in theater. Especially in this movie, I was always taking my cues from the timing of the actors, and I learned early on that, even though his character is spiritually bankrupt and barely alive emotionally, you almost always had to stay with Denzel. He’s a very mysterious guy, and this is such a raw and profound piece of work on his part." Viewers in love with Zemeckis the spectacle-maker will be plenty satisfied after seeing the plane-crash sequence—a convincingly terrifying blend of live-action and computer-generated imagery—that sets Whip on a many-obstacled path to recovery. But there’s an equal, if not more powerful, fluency to the movie’s numerous introspective dialogue scenes, like a standout conversation in a hospital stairwell between Whip, fellow addict Nicole (Kelly Reilly) and a cancer patient (James Badge Dale) with some harshly direct near-death insights. “That’s my favorite,” Zemeckis enthuses. “When that scene popped up around page 40 in John’s script, I just thought it was such a bold stroke. I loved it. And then my first concern was, Could it be pulled off in a modern movie? When you’re doing action, it’s all design, making sure you get all the pieces for pure cinema. When you’re doing a scene that’s primarily performance, I think it’s the director’s job, very simply, to modulate. But everybody’s got to collaborate." It’s scenes like that that show Zemeckis’s commitment to melding impassioned, intelligent introspection to mass-audience marvels, a rare bird on the multiplex circuit. 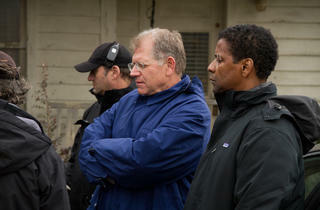 Asked to elaborate on his comment about the current state of movies, Zemeckis reiterates his cure-all. “I really believe that once we get over this endless discussion about the technique and the technology, it’ll have to come back to storytelling. It’s going to come back to writing. Nothing is written by accident.” He pauses before finishing the thought with a bit of wisdom that could fit perfectly into his protagonist’s mouth post-12-step. “Nothing happens by accident." Flight opened Friday November 2, 2012.